Halcyon G. Skinner Ph.D., M.P.H., Janice Blanchard M.D., Ph.D., and Anne Elixhauser, Ph.D. There are a number of factors that may affect both positive and negative trends in growth for condition-specific ED visits. Some of those factors are personal, such as an individual's specific health condition. Other factors are related to the community where the individual lives—for example, the availability of health care options. Changes in health care are reflected in ED use. For example, with improved care coordination some conditions may now be more effectively managed in the outpatient setting, which reduces the need for the acute care provided by EDs.3,4 Updated information about trends in ED use over time reveals the changing needs of individuals in the community and emerging transformations in health care policies. This HCUP Statistical Brief presents data on changes in overall ED visits from 2006 through 2011. ED visit rates are reported by patient demographic characteristics and tracked by patient age. Changes in ED visit rates for the most common conditions and the conditions with the greatest changes also are provided. Changes in rates are considered statistically significant if the p-value is 0.05 or less. Table 1 presents ED visit rates in 2006 and 2011 by patient characteristics, along with the percent change over that time period. The rate of ED visits over the 5-year period from 2006 to 2011 increased among patients aged 45-64 years (8 percent increase). Across all conditions with at least 100,000 ED visits in 2006, the most rapid increase (74 percent) by 2011 occurred for septicemia, a bloodstream infection. The most rapid decrease (30 percent) occurred for noninfectious gastroenteritis. Between 2006 and 2011, the rate of ED visits for substance-related disorders (not including alcohol) increased 48 percent. Over the same time period, ED visits for alcohol-related disorders increased 34 percent. Among the most common reasons for ED visits, sprains and strains and superficial injury each experienced approximately a 10 percent decrease in the rate of ED visits from 2006 to 2011. Increases in the rates of ED visits were observed for abdominal pain (18 percent) and nonspecific chest pain (13 percent). All rates were rounded to the nearest 100. Percent change is reported based on nonrounded rates. The rate of emergency department visits increased for individuals aged 45-64 years. The rate of ED visits for individuals aged 45-64 years increased from 33,000 per 100,000 population in 2006 to 35,800 per 100,000 population in 2011. This was an 8 percent increase over the 5-year time period. The rate of emergency department visits increased for women. The rate of ED visits increased from 43,000 per 100,000 women in 2006 to 45,800 per 100,000 women in 2011, which represented a 6 percent increase over 5 years. Large central cities had the largest increase in the rate of ED visits. Between 2006 and 2011, large central metropolitan areas experienced a 22 percent increase in the rate of ED visits over 5 years, from 31,900 to 39,000 visits per 100,000 population. Figure 1 presents the trend in ED visit rates (per 100,000 population) by patient age group from 2006 through 2011. Figure 1. Trends in ED visit rates by patient age, 2006-2011. Figure 1 is a line graph showing the changes in ED visit rates per 100,000 population across 6 years for 6 age groups. Visit rates for individuals younger than 1 year began at 88,900 in 2006, reached a low of 79,400 in 2010, and ended at 81,600 in 2011. Visit rates for individuals aged 1-17 years began at 32,700 in 2006 and remained relatively stable, ending at 33,800 in 2011. Visit rates for individuals aged 18-44 years began at 43,300 in 2006 and remained relatively stable, ending at 45,400 in 2011. Visit rates for individuals aged 45-64 years began at 33,000 in 2006 and slowly increased to 35,800 in 2011. Visit rates for individuals aged 65-84 years began at 48,900 in 2006 and remained relatively stable, ending at 49,500 in 2011. Visit rates for individuals aged 85 years or older were consistently the highest. They began at 90,900 in 2006 and ended at 93,500 in 2011. Source: Agency for Healthcare Research and Quality (AHRQ), Center for Delivery, Organization, and Markets, Healthcare Cost and Utilization Project (HCUP), Nationwide Emergency Department Sample (NEDS), 2006-2011. The ED visit rate was consistently highest among the oldest patients. The rate of ED visits was consistently highest among the individuals aged 85 years and older, with rates essentially unchanged between 2006 and 2011. The rate of ED visits declined among infants. In 2006, the rate of ED visits for infants younger than 1 year was approximately as high as the rate for adults aged 85 years and older (89,000 visits per 100,000 population for infants versus 90,900 per 100,000 population for adults aged 85 years and older). However, the ED visit rate for infants declined by 11 percent for the 5-year period from 2006 to 2011. By 2011, the ED visit rate for infants was significantly lower than the rate for adults aged 85 years and older (81,600 versus 93,500 per 100,000 population). The rate of ED visits increased gradually for individuals aged 45-64 years. The rate of ED visits increased consistently between 1 and 3 percent per year for individuals aged 45-64 years from 2006 to 2011. The net change over the 5-year period was an 8 percent increase for individuals in this age group. Figure 2 presents the conditions that were most commonly seen in the ED in 2006 and examines the changes in ED visit rates for those conditions in 2011. Note: Conditions were identified using AHRQ's Clinical Classifications Software (CCS) based on first-listed diagnosis. The 20 most common conditions were those identified in 2006. Only conditions with at least 100,000 ED visits in 2006 were included. The most common conditions in 2011 are listed first. Rates are for 2011 and rounded to the nearest whole number. Percent differences were computed based on nonrounded rates. All differences were statistically significant at p<0.05. Figure 2. 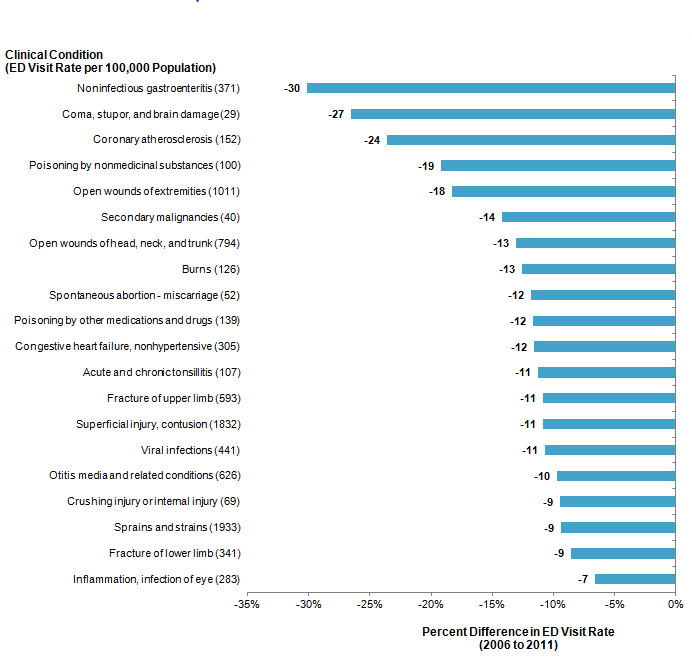 Changes in ED visit rates from 2006 to 2011 for the 20 most common conditions seen in the ED in 2006 and the ED visit rates (per 100,000 population) in 2011. Figure 2 is a bar graph showing the ED visit rate per 100,000 population for 20 clinical conditions and the percent difference in ED visit rates from 2006 to 2011. Note: Conditions were identified using AHRQ's Clinical Classifications Software (CCS) based on first-listed diagnosis. The 20 most common conditions were those identified in 2006. Only conditions with at least 100,000 ED visits in 2006 were included. The most common conditions in 2011 are listed first. Rates are for 2011 and rounded to the nearest whole number. Percent differences were computed based on nonrounded rates. All differences were statistically significant at p<0.05. Sprains and strains visit rate 1,933, -9% difference from 2006 to 2011; superficial injury, contusion visit rate 1,832, -11% difference; abdominal pain visit rate 1,788, 18% difference; nonspecific chest pain visit rate 1,413, 13% difference; open wounds of extremities visit rate 1,011, -18% difference; intervertebral disc disorders, other back problems visit rate 1,197, 7% difference; skin and subcutaneous tissue infections visit rate 1,102, 9% difference; headache, including migraine visit rate 974, 1% difference; open wounds of head, neck, and trunk visit rate 794, -13% difference; urinary tract infections visit rate 1,018, 14% difference; otitis media and related conditions visit rate 626, -10% difference; fracture of upper limb visit rate 593, -11% difference; asthma visit rate 621, 4% difference; pneumonia visit rate 569, -5% difference; COPD and bronchiectasis visit rate 636, 13% difference; disorders of teeth and jaw visit rate 627, 12% difference; noninfectious gastroenteritis visit rate 371, -30% difference; allergic reactions visit rate 542, 6% difference; viral infections visit rate 441, -11% difference; and nausea and vomiting visit rate 569, 18% difference. Source: Agency for Healthcare Research and Quality (AHRQ), Center for Delivery, Organization, and Markets, Healthcare Cost and Utilization Project (HCUP), Nationwide Emergency Department Sample (NEDS), 2006 and 2011. The rates of ED visits decreased for the two most common minor trauma conditions. The rate of ED visits for the two most common conditions (sprains and strains; superficial injury and contusion) decreased substantially between 2006 and 2011. In 2006, there were about 6.4 million ED visits for sprains and strains (a rate of 2,133 visits per 100,000 population). In 2011, the rate of visits for sprains and strains declined by 9 percent to 1,933 per 100,000 population, based on over 6.0 million ED visits for this condition. Similarly, the rate of ED visits for superficial injury and contusion declined 11 percent from 2006 to 2011. In 2006 there were 6.1 million visits for superficial injury and contusion, compared with 5.7 million visits in 2011 (2,056 versus 1,832 visits per 100,000 population, respectively). The rates of ED visits increased for some common nonspecific conditions. The rates of ED visits for abdominal pain and nonspecific chest pain—the third and fourth most common reasons for ED visits overall—increased substantially between 2006 and 2011. Nonspecific diagnoses suggest that no underlying cause was found for these symptoms during the ED visit. The rate of ED visits for abdominal pain increased by 18 percent, from 1,513 per 100,000 population in 2006 to 1,788 per 100,000 population in 2011, with 5.6 million visits in 2011. ED visits for nonspecific chest pain increased 13 percent, with rates of 1,252 visits per 100,000 population in 2006 and 1,413 visits per 100,000 population in 2011 (4.4 million visits in 2011). ED visits for nausea and vomiting increased by 18 percent. Figure 3 presents the conditions that had the largest increase in the rates of ED visits from 2006 to 2011 among those conditions with at least 100,000 ED visits in 2006. Note: Conditions were identified using AHRQ's Clinical Classifications Software (CCS) based on first-listed diagnosis. Only conditions with at least 100,000 ED visits in 2006 were included. The most common conditions in 2011 are listed first. Rates are for 2011 and rounded to the nearest whole number. Percent differences are computed based on nonrounded rates. All differences were statistically significant at p<0.05. Figure 3. Conditions with largest increases in ED visit rates from 2006 to 2011 and the ED visit rates (per 100,000 population) in 2011. 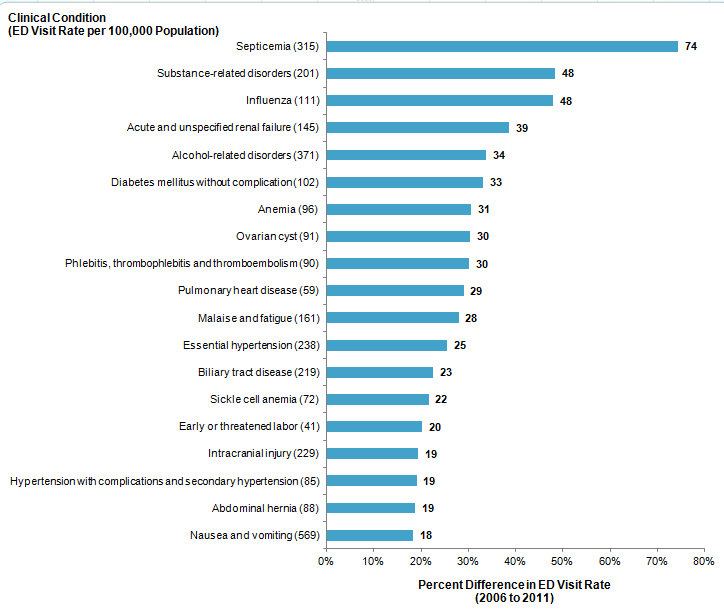 Figure 3 is a bar graph showing the ED visit rate per 100,000 population for 20 clinical conditions and the percent difference in ED visit rates from 2006 to 2011. Note: Conditions were identified using AHRQ's Clinical Classifications Software (CCS) based on first-listed diagnosis. Only conditions with at least 100,000 ED visits in 2006 were included. The most common conditions in 2011 are listed first. Rates are for 2011 and rounded to the nearest whole number. Percent differences are computed based on nonrounded rates. All differences were statistically significant at p<0.05. Septicemia visit rate 315, 74% difference from 2006 to 2011; substance-related disorders visit rate 201, 48% difference; influenza visit rate 111, 48% difference; acute and unspecified renal failure visit rate 145, 39% difference; alcohol-related disorders visit rate 371, 34% difference; diabetes mellitus without complication visit rate 102, 33% difference; anemia visit rate 96, 31% difference; ovarian cyst visit rate 91, 30% difference; phlebitis, thrombophlebitis, and thromboembolism visit rate 90, 30% difference; pulmonary heart disease visit rate 59, 29% difference; malaise and fatigue visit rate 161, 28% difference; essential hypertension visit rate 238, 25% difference; biliary tract disease visit rate 219, 23% difference; sickle cell anemia visit rate 72, 22% difference; early or threatened labor visit rate 41, 20% difference; intracranial injury visit rate 229, 19% difference; hypertension with complications and secondary hypertension visit rate 58, 19% difference; abdominal hernia visit rate 88, 19% difference; and nausea and vomiting visit rate 569, 18% difference. Source: Agency for Healthcare Research and Quality (AHRQ), Center for Delivery, Organization, and Markets, Healthcare Cost and Utilization Project (HCUP), Nationwide Emergency Department Sample (NEDS), 2006 and 2011. ED visits for two infection-related diagnoses increased substantially between 2006 and 2011. Visits to the ED for substance-related disorders (not including alcohol) and for alcohol-related disorders increased. Between 2006 and 2011, the rate of ED visits for substance-related disorders not including alcohol increased 48 percent (from 136 to 201 visits per 100,000 population). Over the same time period, visits for alcohol-related disorders increased 34 percent from 277 to 371 visits per 100,000 population. ED visits for acute and unspecified renal failure increased by 39 percent from 2006 to 2011. In 2006, there were approximately 313,000 ED visits for acute and unspecified renal failure—a rate of 105 per 100,000 population. In 2011, there were 453,000 visits for this diagnostic category—a rate of 145 per 100,000 population, which represents a 39 percent increase from 2006. ED visits for several common chronic conditions increased significantly from 2006 to 2011. Diabetes mellitus visits increased 33 percent, pulmonary heart disease visits increased 29 percent, and visits for essential hypertension increased 25 percent. The only injury that appeared on the top 20 list of rapidly increasing conditions from 2006 to 2011 was intracranial injury. Intracranial injury visit rates increased 19 percent, from 192 per 100,000 population in 2006 to 229 per 100,000 population in 2011. Figure 4 presents the conditions with at least 100,000 ED visits in 2006 with the largest decreases in ED visit rates from 2006 to 2011. Note: Conditions were identified using AHRQ's Clinical Classifications Software (CCS). Only first-listed diagnoses were included. Only conditions with at least 100,000 ED visits in 2011 were included. Rates are for 2011 and rounded to the nearest whole number. Percent differences were computed based on nonrounded rates. All differences were statistically significant at p<0.05. Figure 4. Conditions with the largest decreases in ED visit rates from 2006 to 2011 and rates of ED visits (per 100,000 population) in 2011. 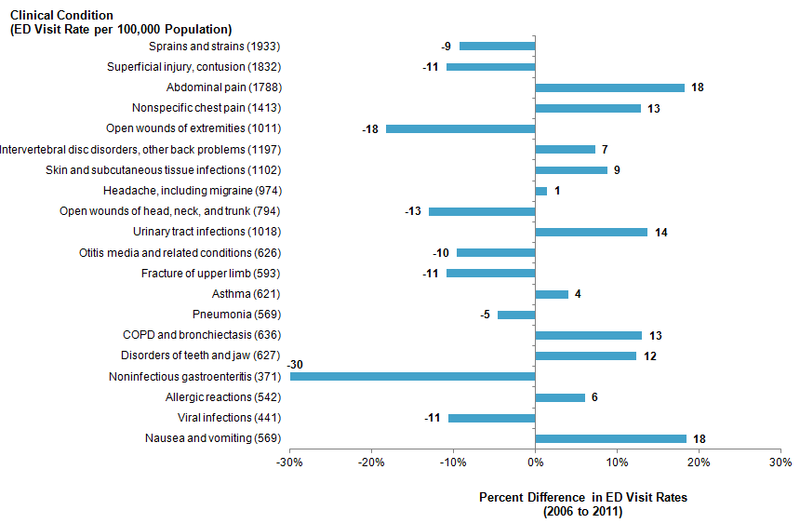 Figure 4 is a bar graph showing the ED visit rate per 100,000 population for 20 clinical conditions and the percent difference in ED visit rates from 2011 to 2006. Note: Conditions were identified using AHRQ's Clinical Classifications Software (CCS). Only first-listed diagnoses were included. Only conditions with at least 100,000 ED visits in 2011 were included. Rates are for 2011 and rounded to the nearest whole number. Percent differences were computed based on nonrounded rates. All differences were statistically significant at p<0.05. Noninfectious gastroenteritis visit rate 371, -30% difference from 2011 to 2006; coma, stupor, and brain damage visit rate 29, -27% difference; coronary atherosclerosis visit rate 152, -24% difference; poisoning by non-medicinal substances visit rate 100, -19% difference; open wounds of extremities visit rate 1,011, -18% difference; secondary malignancies visit rate 40, -14% difference; open wounds of head, neck, and trunk visit rate 794, -13% difference; burns visit rate 126, difference -13% difference; spontaneous abortion-miscarriage visit rate 52, -12% difference; poisoning by other medications and drugs visit rate 139, -12% difference; congestive heart failure, nonhypertensive visit rate 305, -12% difference; acute and chronic tonsillitis visit rate 107, -11% difference; fracture of upper limb visit rate 593, -11% difference; superficial injury, contusion visit rate 1,832, -11% difference; viral infections visit rate 441, -11% difference; otitis media and related conditions visit rate 626, -10% difference; crushing injury or internal injury visit rate 69, -9% difference; sprains and strains visit rate 1,933, -9% difference; fracture of lower limb visit rate 341, -9% difference; and Inflammation, infection of eye visit rate 283, -7% difference. Source: Agency for Healthcare Research and Quality (AHRQ), Center for Delivery, Organization, and Markets, Healthcare Cost and Utilization Project (HCUP), Nationwide Emergency Department Sample (NEDS), 2006 and 2011. ED visits for noninfectious gastroenteritis decreased from 2006 to 2011. Noninfectious gastroenteritis had the largest decrease in the rate of ED visits from 2006 to 2011—a 30 percent decline over the 5-year period. In 2006, there were about 1.6 million visits for noninfectious gastroenteritis, representing a rate of 531 visits per 100,000 population. In 2011, there were 1.2 million visits for noninfectious gastroenteritis, representing a rate of 371 visits per 100,000 population. ED visits related to coma, stupor, and brain damage decreased. Between 2006 and 2011, ED visits for coma, stupor, and brain damage decreased 27 percent, from a rate of 40 to 29 visits per 100,000 population, respectively. Many injuries appear on the top 20 list of conditions with the greatest decreases in rates. Injuries with significant declines in the rate of ED visits included poisoning by nonmedicinal substances (19 percent); open wounds of the extremities (18 percent); open wounds of the head, neck, and trunk (13 percent); burns (13 percent); poisoning by medicines and drugs (12 percent); fracture of the upper limb (11 percent); superficial injury (11 percent); crushing injury (9 percent); sprain or strain (9 percent); and fracture of lower limb (9 percent). ED visits related to coronary atherosclerosis decreased. ED visits for coronary atherosclerosis decreased 24 percent from 2006 to 2011. In 2006, there were 594,300 ED visits for coronary atherosclerosis, representing a rate of 199 visits per 100,000 population. The rate declined to 152 visits per 100,000 population in 2011, based on 474,400 visits for this condition. A number of infections appear on the top 20 list of conditions with the greatest decreases in rates. There were significant decreases in the number of ED visits related to three types of infections: tonsillitis (11 percent), viral infections (11 percent), and eye infections (7 percent). The estimates in this Statistical Brief are based upon data from the Healthcare Cost and Utilization Project (HCUP) Nationwide Emergency Department Sample (NEDS), 2006 through 2011. The statistics were generated from HCUPnet, a free, online query system that provides users with immediate access to the largest set of publicly available, all-payer national, regional, and State-level hospital care databases from HCUP.6 Supplemental sources included population denominator data for use with HCUP databases.7 P-values were computed using a two-sample z-test. Results were considered nominally significant if the value was 0.05 or less. CCS categorizes ICD-9-CM diagnoses into a manageable number of clinically meaningful categories.8 This "clinical grouper" makes it easier to quickly understand patterns of diagnoses. CCS categories identified as "Other" typically are not reported; these categories include miscellaneous, otherwise unclassifiable diagnoses that may be difficult to interpret as a group. Place of residence is based on the urban-rural classification scheme for U.S. counties developed by the National Center for Health Statistics (NCHS). The HCUP Nationwide Emergency Department Database (NEDS) is a unique and powerful database that yields national estimates of emergency department (ED) visits. The NEDS was constructed using records from both the HCUP State Emergency Department Databases (SEDD) and the State Inpatient Databases (SID). The SEDD capture information on ED visits that do not result in an admission (i.e., treat-and-release visits and transfers to another hospital); the SID contain information on patients initially seen in the emergency room and then admitted to the same hospital. The NEDS was created to enable analyses of ED utilization patterns and support public health professionals, administrators, policymakers, and clinicians in their decision-making regarding this critical source of care. The NEDS is produced annually beginning in 2006. Introduction to the HCUP Nationwide Emergency Department Sample (NEDS) 2011. Online. December 2013. U.S. Agency for Healthcare Research and Quality. http://www.hcup-us.ahrq.gov/db/nation/neds/NEDS2011Introduction01142014.pdf. Accessed September 11, 2014. Skinner H (Truven Health Analytics), Blanchard J (RAND), Elixhauser A (AHRQ). 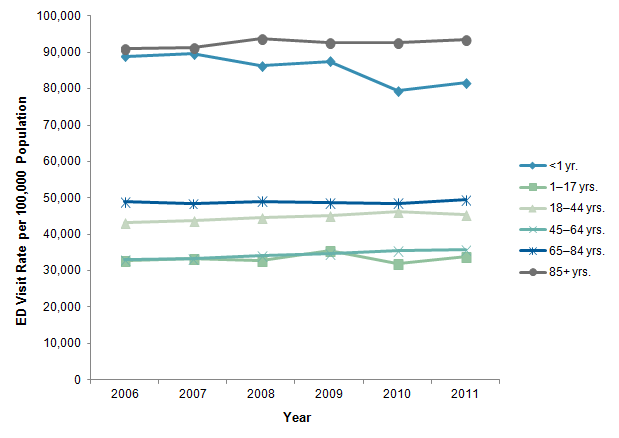 Trends in Emergency Department Visits, 2006-2011. HCUP Statistical Brief #179. September 2014. Agency for Healthcare Research and Quality, Rockville, MD. http://www.hcup-us.ahrq.gov/reports/statbriefs/sb179-Emergency-Department-Trends.pdf. 1 Weiss AJ, Wier LM, Stocks C, Blanchard J. Overview of Emergency Department Visits in the United States, 2011. HCUP Statistical Brief #174. June 2014. Agency for Healthcare Research and Quality, Rockville, MD. http://www.hcup-us.ahrq.gov/reports/statbriefs/sb174-Emergency-Department-Visits-Overview.pdf. Accessed August 12, 2014. 2 Tang N, Stein J, Hsia RY, Maselli JH, Gonzales R. Trends and characteristics of US emergency department visits, 1997-2007. Journal of the American Medical Association. 2010;304:664-70. 3 Brown RS, Peikes D, Peterson G, Schore J. Six features of Medicare coordinated care demonstration programs that cut hospital admissions of high-risk patients. Health Affairs. 2012;31:1156-66. 4 Foote S. Population-based disease management under fee-for-service Medicare. Health Affairs. 2003;W3-342-56. 5 Centers for Disease Control and Prevention. Past Flu Seasons. Last updated July 2014. http://www.cdc.gov/flu/pastseasons/index.htm. Accessed August 12, 2014. 6 Agency for Healthcare Research and Quality. HCUPnet web site. http://hcupnet.ahrq.gov/. Accessed April 25, 2014. 7 Barrett M, Lopez-Gonzalez L, Coffey R, Levit K. Population Denominator Data for use with the HCUP Databases (Updated with 2012 Population data). HCUP Methods Series Report #2013-01. Online. March 8, 2013. U.S. Agency for Healthcare Research and Quality. http://www.hcup-us.ahrq.gov/reports/methods/2013_01.pdf. Accessed December 13, 2013. 8 HCUP Clinical Classifications Software (CCS). Healthcare Cost and Utilization Project (HCUP). U.S. Agency for Healthcare Research and Quality, Rockville, MD. Updated November 2013. http://www.hcup-us.ahrq.gov/toolssoftware/ccs/ccs.jsp. Accessed December 13, 2013. Internet Citation: Statistical Brief #179. Healthcare Cost and Utilization Project (HCUP). September 2014. Agency for Healthcare Research and Quality, Rockville, MD. www.hcup-us.ahrq.gov/reports/statbriefs/sb179-Emergency-Department-Trends.jsp.